- Mount Sanford photos. Mount Sanford is one of the largest mountains in the Wrangell Mountains, and the 4th highest mountain in Wrangell - St. Elias National Park and Preserve. At 16 237' ASL, it's one of the notable mountains in North America. Mount Sanford is the 6th highest peak in the US. Mt. Sanford and reflection, Wrangell St. Elias National Park and Preserve, Alaska. Mt. Sanford and reflection, Wrangell St. Elias NP, Alaska. Snowshoeing near Mount Sanford, Wrangell St. Elias Park, Alaska. Mount Sanford and the boreal forest, Wrangell - St. Elias National Park and Preserve, Alaska. Mt. Sanford, Wrangell St. Elias National Park, Alaska. Mount Sanford, Wrangell St. Elias National Park, Alaska. Mt. Sanford panoramic, Wrangell St. Elias National Park, Alaska. 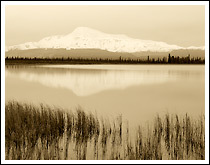 Mount Sanford photo, from the Chistochina River, Wrangell - St. Elias National Park, Alaska. Simpson Hill Overlook view, Wrangell - St. Elias National Park, Alaska. Mt. Sanford photo, and the Sanford Glacier. Wrangell St. Elias, Alaska. Photo of Mount. Sanford, Wrangell - St. Elias National Park and Preserve, Alaska. Mount Sanford and Wrangell, Wrangell - St. Elias National Park and Preserve, Alaska. Hiker and Mt. Sanford, Wrangell St. Elias National Park, Alaska. Copper River, Mt Drum, Wrangell - St. Elias National Park, Alaska. Mt Sanford, Willow Lake, Winter, Wrangell - St. Elias National Park, Alaska. Mt. 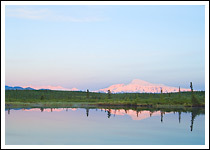 Sanford and reflection photo, Wrangell - St. Elias National Park and Preserve, Alaska. Aurora borealis photo and Mt. Drum, Copper River, Alaska. Aurora borealis picture and Mt. Drum, Copper River, Alaska.